Relieved, I let the book fall behind a stone. I climb a slight rise of grass. Casting shadows so frail that I can see through them. I close my eyes for a moment and listen. I want to hear them, they have clear sounds to make. Since my birthday falls exactly on a Friday this year, I decided to do some extra sharing for this week’s post. First, I will not only present a poem but also present one of my own that is in conversation with it. First, we have James Wright’s poem above, a short lyric I admire for the way it brings several worlds. The title sets up a casual, almost glib tone, and its directness is interesting to sit with before and after reading the poem. Before reading, the title suggests not simply critique but also a desire to start again via an “unused” pasture. After reading the poem, the title takes on a more literal arc: from the “depressed” start, to the “invitation,” one can see in the title the whole range of emotion traveled in the poem. In my own poem in conversation with Wright’s, I found myself pushing against the self in the same spirit of indirectness. Probably telling of my personality that I tend to disappear in poems. out in an unused pasture. I’m sharing only what the front and back cover look like as the poem inside (“Mesquite”) didn’t photograph all that well. I had a lot of fun creating this monopoem and plan to continue with other issues. They’re fun artifacts to share at readings. I have already shared some of these with my Canto fam via post as well as with the winners from the giveaway earlier this month. * excerpt from The Divorce Suite! Just a quick post to follow up on the release of my latest chapbook, The Divorce Suite, published by Red Bird Chapbooks! I was really stoked to get the first in the print one of 100! I also wanted to follow up with an excerpt from the book. Here’s one of the short lyrics that precedes the title poem. A couple of different mythologies get interwoven into the narrative of the collection. Here, I take an indirect approach to Lethe, the river of forgetfulness. I’d have to learn to read. Copies are still available for purchase from Red Bird Chapbooks! Feel free to share which number you get in the comments. This week’s poem, “If You Ever Visit Huhi” by Gerardo Pacheco Matus, is accompanied with some comments by the poet talking about the craft behind the poem. I had the distinct pleasure of meeting Gerardo at this year’s CantoMundo conference. Between lectures, workshops, and readings, I had the opportunity to get know him and his work, and I am happy to be able to share some of it here with y’all. The poem below is full of the heart and wisdom of the poet I met and shared rough drafts with during Canto. What I moved me right away in the poem is the songlike nature, the refrain working nicely to move the poem through various tones of emotion and scenes. I was happily surprised to learn that this poem had its origins in a musical form. I believe that poems or poetry is just another way to tell a story. Indeed, this is what I aim when I am writing a poem. “If You Ever Visit Huhi” is a poem that uses refrains. At the time, I wrote this poem, I was intrigued/ mesmerized by villanelles. Indeed, this poem began as a villanelle. The repeated line, “if you ever visit huhi” drove me nuts for days. My first attempts of this piece were villanelles, but the poem wasn’t working. Professor Paul Hoover took a look at the poem, and his first advised was to get rid of the form (villanelle) and let it be. As you may know, I felt puzzled by breaking away from the form, but I knew it needed to be done. I thought that by keeping some elements of the form, in this case the refrains, will be beneficial. I kept the refrains and the narrative element and the poem. One of the few things I remember or the teaching lesson if you will is to work with form and also experiment with form. I wanted to comply with form so bad that I wasn’t paying attention to other important things in the poem. I wanted to force this idea/ story into a form that wasn’t working. I am glad I broke away from the form and experimented a little. What I most connect with right away in Gerardo’s comments is that crucial space where a poem begins to move away from the form you originally saw it in and have to begin to trust the poem to guide you in writing it. The move from the villanelle into a longer, more narrative piece made for a strong poem that sings its details. Intuition is innate; but finding the right moment to give over to it is the hard part. Successfully recognizing such moments and following them through with vision and insight can result in astonishingly rich and detailed poems like the one below. they live in a small house with mud walls. i have not slept for years and i want to dream again. it is to be thirsty and have no water to drink. with lots of red onions, and chiles habaneros. i am always thinking about her and my grandfather, el leñador. someone is waiting for me makes me happy. will pray to the Virgin de Guadalupe a whole year. pour some on top of my grave. i am thirsty. at the town where i was born many summers ago. water as i am dead and very thirsty. P.S. Make sure to check out my post earlier this week regarding my new chapbook, The Divorce Suite! * new chapbook: The Divorce Suite! Just a quick post to announce the release of my latest chapbook, The Divorce Suite, published by Red Bird Chabooks! Copies can be ordered here. This chapbook centers on a series of poems inspired by my divorce back in 2010. It takes on the idea of divorce as a fulcrum into change, the narrative itself playing out in various forms: from makeshift sonnets, tanka sequences, and the lyric/prose hybrid of the title poem, to the mutated sestina that closes the book, divorce is seen as both event and momentum. The particular river that runs through this chapbook is the Willamette, as much of the telenovela that was my first marriage played out in Eugene, Oregon. One of the reasons I’m especially excited about this project is that it brings together a specific sequence of poems around this subject. While the title poem and a small selection of other poems from this chapbook will be featured in my next collection, Small Fires (due out in 2017), this chapbook presents its own particular reading experience. The difference is similar to having a radio edit versus hearing the full version of a song. Special thanks to Eric Hove & Sarah Hayes for being great to work with as well as to everyone at Red Bird Chapbooks! RBC’s chapbooks are hand-crafted art objects, making this publication all the more special. Red Bird Chapbooks is planning a print run of 100 copies, so please hurry and snag a copy! After having done a couple of “microreview & interviews” for the Cincinnati Review blog, I have decided to incorporate the form into The Friday Influence. Essentially, I’ll highlight a couple of poems as well as responses from the poet to a question or two specifically about influences. My goal remains centered on sharing things I’ve read and want to share with the community of readers of this blog, as well as to promote specific poets and be a poetry ambassador in general. I plan to do one microreview & interview about every two months, posting on Mondays typically, except for this first one which I wanted to highlight today. Below is the first official TFI microreview & interview featuring Jeff Sirkin’s Traveler’s Aid Society. a source of pride and soap. What do you think? I ask. Well, he offers, the coffee’s always terrible. Will I make it home? I chose this poem specifically from the book because it serves as a good example of the way Sirkin is able to blend intimate intellectual insights with moments from day to day life throughout Travelers Aid Society. The language and phrasing of the second stanza, for example, is the kind of poetically charged statement that points beyond its meaning within a narrative. The words “a dark place” and “company” have their place in terms of politically conscious tone of the poem, but implied also is human company as well as the corporate type (like Proctor and Gamble mentioned later). A collection whose “home” ranges from the poet’s experiences in El Paso, Buffalo, and Cincinnati, this kind of linguistic friction works to humanize where the poet is at, mentally as much as geographically. This feeling of trying to keep up via poetic means remains constant throughout the collection. What the poems try to keep up with for the most part is history, both in terms of personal memory and the history forgotten/neglected in documents and archives. The title poem, included below, is a good example of the way these two sides of history can be in dialogue in a poem. In the crucible of the poem, memory and archives help create a space outside themselves that allows for history to move beyond its own established narratives. The hill falls, the daily paper shrinks. because of the new machine. plan for the Historical Society library. paper. My network of convenience packaging. I search for The Jungle Scout. The Hobo News Review. but no one cares to comment. of a hundred defunct railroad companies. Danville and Pottsville. Greenville and Miami. Sunbury and Erie. Hillsborough and Cincinnati. to arrest the sliding soil. Influence Question: There is an interest in the title poem and elsewhere with researching hobo culture. Can you speak a little about this interest as well as the overall political framework of this book? Jeff Sirkin: “My interest in hobo culture emerged from several things. One of these was Kerouac’s On the Road, which I’ve taught a number of times over the past several years, and which, despite its flaws, I continue to find compelling. Among other things, the novel creates a spectrum of different character types found “on the road” (from commuters, to tourists, to college students on summer adventures, to itinerant workers). Of these, hoboes are regarded as the most pure, having achieved almost a state of grace in their rootless wandering. As if, having committed themselves to the road (and thus movement) instead of some tenuous dream of property and “home,” they’ve separated themselves from the consumer capital/ industrial/ modern world, and thus exist almost as holy ghosts, skirting the edges of our reality and perception, visible only to those open to seeing beyond the reality of workaday life. Free, in a sense of the ideological frames and boundaries refracted in and through our bodies as our daily lives and dreams. “Secondly, in April 2011, just as I was really getting started on this book, a friend of mine from Cincinnati—a musician and wanderer and free spirit—was shot and killed by a police officer in Cincinnati under confused and suspicious circumstances. I discovered only after his murder that he had lived as a hobo at one time. The idea of the hobo had already come up in some of the poems, but this incident brought to the fore some of the issues and themes I was already starting to think about: frames and boundaries; property; what “inside” is and means; what it might mean to be “outside” and what the cost to transgress that border; the structures of power that create and hold us as subjects. And this is not to forget what the cost for those who by virtue of the color of their skin or nationality or background or sexual orientation or identity or expression aren’t given the option to ‘choose’ their own relationship to culture, whose status as “outlaw” is imposed upon them from the start. “Finally, early on as I was researching both hobo history and Cincinnati, I discovered that Cincinnati was, in the early part of the 20th century, an important locus for hoboes and hobo history. Jeff Davis—self-styled “King of the Hoboes” and founder of a chain of cheap lodging houses in cities across the U.S. called “Hotel de Gink” (“established, ran by, and for hoboes”)—was born in Cincinnati in 1883. He hit the road at the age of 13, traveled the world as a hobo, and was a leader in hobo culture, working tirelessly for hobo rights (and labor rights), founding and leading the Hoboes of America organization for many years. He died in his hometown of Cincinnati in 1968, at the age of 84. It remains curious to me, having grown up in Cincinnati and having lived there as an adult for many years, and then returning to do research there, not only that I’d never heard about Cincinnati’s hobo history, but that I couldn’t find a trace of it. Maybe it was never recorded; maybe it’s been forgotten; maybe intentionally erased. For me, it became a ghost whispering about a city that may or may not exist in the shadows of the one I think I know. Final thoughts: Reading this collection, I admired how the layers of memory and fact kept being acknowledged and explored throughout. One of the poetry’s responsibilities, according to these poems, would seem to be listening in on and recording what we can of the ghosts around us. Poetry, then, can be seen as one way to resist settling for the prescribed narratives expected of us and also a means to finding one’s own path to the rest of the story. Travelers Aid Society can be purchased from Veliz Books. Special thanks to Jeff Sirkin for participating in this microreview & interview! To find out more about his work, visit his site. I am happy to report that my next chapbook, The Divorce Suite, will be out in a week or two by Red Bird Chapbooks. This chapbook will have an initial run of 100 copies. More info soon! Here are links to some recent online publications that I feel are definitely worth reading and supporting. The first is Glass: A Journal of Poetry’s recent Orlando tribute feature “Pulsamos: LGBTQ Poets Respond to the Pulse Nightclub Shooting.” Some great poems in there from Emily Rose Cole, Steven Sanchez, and Darrel Alejandro Holnes among other fine work. The other recent publication I’d like to share is the first issue by The Deaf Poets Society: an online journal of disability literature & art. Some strong work from Leah Lakshmi Piepzna-Samarasinha and Mary Peelan among others. Here’s an article on this new online journal from PBS. Lastly, I’d like to thank everyone who entered the Goodreads giveaway. Out of 500 plus entries (each time I think of this number = Wow! *gasp*), 10 were chosen by Goodreads to received signed copies of my chapbook, Reasons (not) to Dance (FutureCycle Press). Those copies should be out shortly. Everyone be on the look out next month for another giveaway, this time of my first full book of poems, Everything We Think We Hear (Floricanto Press). some Wednesday I barely remember. a simple errand, a letter—everything—can go wrong. At CantoMundo this year, I had the opportunity to listen to keynote speaker and former U.S. Poet Laureate Natasha Tretheway speak about her work and the place of memory in her work. Her poems about her mother specifically have meant a lot to me over the years. The poem above, for example, shows how sometimes the things we write about find us, how “material” arises from the immaterial, day to day occurrences. Poems about my father’s death and absence in my life continue to come, and sometimes I worry about repeating myself. On the practical front, I work hard to keep the poems alive in different ways, whether through new forms or structural framework. But there is always the question: How big is grief? How long? That the poems keep coming means that I am far from knowing the answer to such questions. One of the things that keeps me grounded is hearing about the experiences of others. Tretheway’s book, Native Guard, remains important for several reasons, the most prominent being the title poem’s engagement with history and evocation of human experience. But the poems about the poet’s mother mean something deeper for me, and it is something that I feel informs the emotional scope of the collection. There are times, as in this second poem below, where I feel I am reading a poet who understands what it means to make peace with what overwhelms you as much as you can in the moment. how they sometimes fall short. away from home–flitting before her. I listen as my neighbor’s voice trails off. are enough to call someone home. P.S. 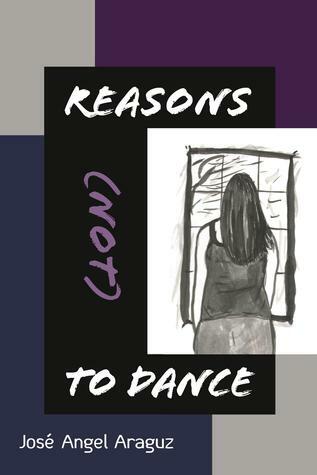 This weekend marks the last chance to enter my Goodreads Giveaway for one of ten signed copies of my prose poem chapbook, Reasons (not) to Dance. Details below! Giveaway ends August 07, 2016.